Saab Automobile President & CEO Jan Åke Jonsson was on hand to see regular production begin, just three months after the 9-4X was unveiled last November at the 2010 Los Angeles Auto Show. 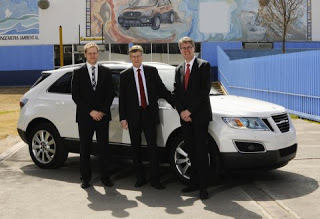 Jonsson was joined by Executive Director Vehicle Lines Anders Svensson and 9-4X Product Manager Mikael Jacobsson. The first vehicle – chassis number 00001 – an Ice Pearl metallic Aero model with a 2.8V6 turbo engine, is bound for a media test drive event in the United States before being shipped to Sweden for display at the Saab car museum. Featuring Saab’s advanced XWD all-wheel-drive system and adaptive chassis control, the 9-4X goes on sale in the United States in May, with sales in Europe and other world markets scheduled to begin from August.